The state Council on Revenues on Tuesday predicted zero revenue growth for this fiscal year and reduced the growth projection for next fiscal year, a significantly downgraded forecast that could handcuff state lawmakers as they draft revisions to the state budget. The council dropped the projection to zero growth for the fiscal year that ends in June, down from 3.3 percent growth in the forecast made in January, a $180 million loss of revenue for the state. Star-Advertiser. Hawaii will have almost a billion dollars less than expected to fund state government programs and pay public workers over the next two years, according to a new economic forecast. The state Council on Revenues in January had projected 3.3 percent growth in general fund revenues for fiscal 2014, which ends June 30. The council voted Tuesday to change its forecast to no growth, although the reasons varied wildly among the seven appointed members who blamed everything from Russia and rain to shark attacks and traffic. Civil Beat. Gov. Neil Abercrombie said Tuesday Hawaii’s state budget is “solid and sound,” despite a downgrade of the state’s revenue forecast by the state Council on Revenues, which is projecting zero percent growth for the current fiscal year. Pacific Business News. 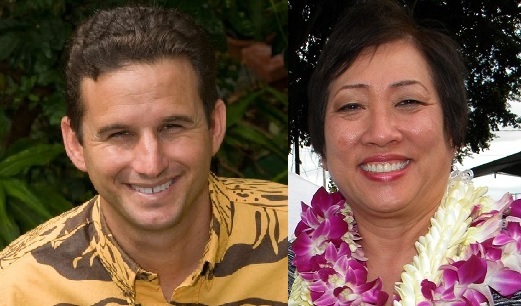 U.S. Rep. Colleen Hanabusa and U.S. Sen. Brian Schatz have agreed to five primary debates in their race to complete the term of late U.S. Sen. Daniel Inouye. Both candidates said Tuesday they agreed to participate in three events in July and two others with dates to be determined. Three of the debates are to be televised statewide, while a fourth will air on Hawaii Public Radio. Hawaii News Now. Of nearly 400 bills the Hawaii House sent the Senate this year, only five were introduced by Republicans. And the party’s minority caucus package of bills was shut out entirely. The dismal numbers underscore the futility Republicans find in the lopsided state Legislature. Democrats outnumber them 44 to seven in the House and 24 to one in the Senate. Associated Press. House Speaker Joe Souki is among seven legislators supporting a resolution that asks Congress to give Hawaii, Alaska and Puerto Rico an exemption from the Jones Act. The Jones Act requires American made ships with American crews transport goods and services between American ports. Hawaii Reporter. Supporters of family-child interaction learning programs brought a makeshift classroom to the Capitol on Tuesday to rally for expanded early-education options. Star-Advertiser. More than a thousand people rallied at the state capitol Tuesday to support early childhood education. KITV4. Hawaii lawmakers have proposed that manufacturers of electronics goods must recycle 50 percent of the pounds of products that each company sells in the state. Senate Bill 2857 was heard in the House Energy and Environmental Protection Committee on Tuesday. Its goal is to give residents on neighbor islands more options to recycle their old televisions, cell phones and a myriad of electronic devices. Associated Press. It had to have been a letdown to Gov. Neil Abercrombie's re-election campaign that a press conference announcing the University of Hawaii Professional Assembly's endorsement attracted just a single reporter. Civil Beat. Lawmakers scrambling to keep the Hawaii Health Connector solvent are proposing a fee for private insurers who decline to take part in the local Obamacare exchange. Hawaii Reporter. Bank of Hawaii has decided to reopen 17 Iranian customers' accounts that were closed in December 2013 in response to the bank's interpretation of U.S. sanctions against Iran. Civil Beat. On Tap at the Hawaii Legislature: March 12 A selective list of bills, resolutions, hearings, briefings and events for Wednesday at the state Capitol. Civil Beat. Honolulu’s Department of Environmental Services says that it’s facing billions of dollars in improvements to three sewage treatment plants if new environmental requirements mandated by the state Department of Health are allowed to go into effect — and it’s planning to fight them. Civil Beat. It’s not uncommon to see Honolulu police officers with tattoos. But that will all change on July 1. That’s when all Honolulu police officers in uniform will be required to cover their tattoos. KHON2. Honolulu city officials Tuesday launched a $13.76 million project to repave two heavily used and deteriorating Mili­lani roads, and Mayor Kirk Caldwell reaffirmed his commitment to a five-year plan to repave 1,500 miles of worn roads. Star-Advertiser. Honolulu City Council members are looking into whether transient vacation units and bed-and-breakfast homes should be taxed at higher rates. Also, they appear ready to tackle related issues such as allowing for more legal short-term residential vacation rentals while cracking down on illegal ones. Star-Advertiser. A beach access that has been gated and locked in Kailua is in violation, just not what one may suspect. Hawaii News Now. Road crews on Thursday will close Kalanianaole Highway in both directions between Hanauma Bay and the Halona Blowhole from 8:30 a.m. to 2:30 p.m. as they remove heavy equipment used in the restoration of the Ihiihilauakea Stream Bridge. Starting Sunday night, there will be two consecutive weeks (excluding weekends) of full overnight closures on the westbound H-1 freeway in town, from Vineyard Boulevard to Halona Street. Star-Advertiser. Honolulu attorney Michael Green filed a lawsuit Tuesday against Kamehameha Schools that alleges the school didn't protect its students from a psychiatrist who allegedly molested them. Star-Advertiser. Hawaii Electric Light Co. put its effort to expand geothermal power on the Big Island on hold after its independent observer criticized the utility for lacking sufficient planning. Tribune-Herald. A man on the FBI’s Most Wanted Terrorist list may be hiding on the Big Island, the agency believes. Daniel Andreas San Diego, 36, is alleged to have been involved in the bombings of two buildings belonging to biotechnology and nutritional products corporations in 2003 in California. Tribune-Herald. UH Hilo has a brand new $19 million dollar student services building that was completed in time to open last Fall. But it has not yet officially opened to the public. School officials SAY there's a compliance issue with the Americans With Disabilities Act. Hawaii Public Radio. The cost to connect homes in the Lono Kona Subdvision to a county sewer line project is estimated to be just under $10,000 per single family equivalent unit. That’s according to an estimate Hawaii County’s Department of Environmental Management has provided to the public prior to a hearing, set for 6 p.m. Tuesday at the West Hawaii Civic Center’s council chambers. West Hawaii Today. Registration requirements for Hawaii island's growers of genetically modified crops are on hold for now because of a judge's ruling. But the question remains: Will the broader scope of the county's new law banning the outside use and testing of modified plants be challenged in court? Star-Advertiser. The nonprofit Hale Mahaolu is proposing to build a 61-unit affordable senior housing project in Pukalani. Maui News. The chairwoman of the state Public Utilities Commission is under investigation for allegedly illegally building and operating a Hana­lei bed-and-breakfast for more than a decade, The Garden Island newspaper on Kauai reported Tuesday. Star-Advertiser. Commentary: It looks like Kauai's Mina Morita, chair of the Public Utilities Commission, is the target of a political hit. The state Department of Land and Natural Resources is suddenly moving to enforce against Morita and her husband, Lance Laney, for operating illegal vacation rentals in Hanalei Valley — just as Gov. Neil Abercrombie is making an unpopular move to dump her as PUC chair. Kauai Eclectic. Commentary: The Attack against Hermina Morita. Ililani Media. Students of all ages are learning more than basic geometry and science at Kula Aupuni Niihau A Kahelelani Aloha Public Charter School, also known as Kanaka. They’re learning life lessons and how to create a sustainable food environment. Garden Island.